July is a wonderful time to visit Myakka River State Park. With fewer crowds this time of year, the park can be a quiet, tranquil place to see wildlife and just relax. Spotted fawns are not uncommon. The rumbling of bellowing gators can be heard. Flowers are blooming. Butterflies are abundant and dragonflies are feasting on mosquitos. Cloud formations can be quite spectacular in summertime, especially at sunset or before a storm. Since July is the beginning of the rainy season, there is usually a lot of standing water on the sides of the roads and on the trails. If the hiking trails are too wet to walk, a trek down Powerline Road can be quite rewarding. You may have to dodge a few puddles, but deep ditches on both sides of the road are filled with water perfect for gators, birds, snakes and aquatic plants. You may see young gators being guarded by a protective mother or an anhinga coming up for air after searching for a meal. Powerline Road, early in the morning or evening, is a great place to see deer, turtles, raccoons and owls. Canoeing and kayaking are great this time of year and a wonderful way to see wildlife on the river. Bring your own vessel, or rent one from the concession. 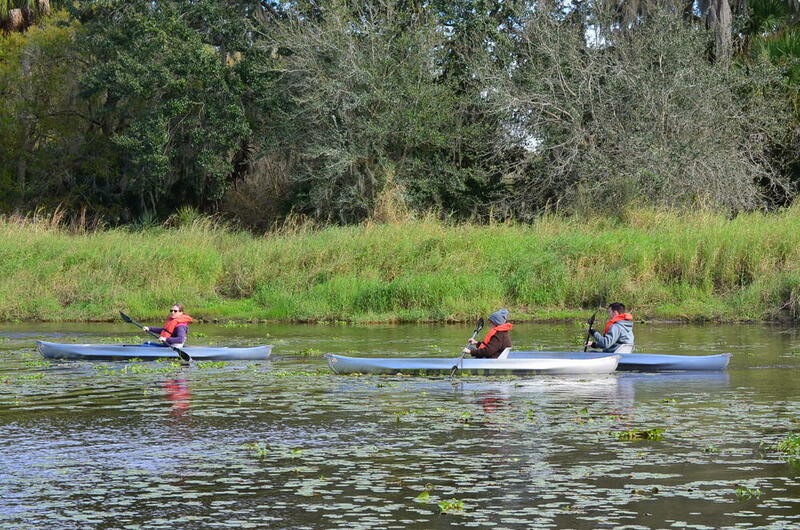 There is no better way to see birds, turtles, fish and alligators than to get on the river for a leisurely paddle. Don’t forget your camera! Another fun thing to do in the summer at Myakka is to take the airboat ride. A very large, covered airboat seating up to 70 people takes passengers for a gentle, breezy cruise around the Upper Myakka Lake. The captain captivates his audience with knowledge of wildlife and park history. Swallow-tail Kites may be seen soaring overhead, or perhaps you will see a gator swimming in the cool water. Wading birds and jumping fish make for a pleasant journey. If hot, humid weather isn’t your thing, there are still ways to enjoy the park. Myakka offers a seven-mile scenic drive, an air conditioned visitor center and a concession that offers a variety of food and ice-cream. If you dine inside, there are great views of the boat basin and lake from the second floor. A beautiful gift shop awaits you with jewelry, home décor, clothing, kid’s stuff and many Myakka souvenirs. If you are a photographer, some of the flowers to be on the watch for this time of year are Swamp Hibiscus, Black-eyed Susan, Trumpet-creeper, Spider Lily, Beauty Berry, Tar-flower and Buttonbush. In the butterfly garden in front of the ranger station, Ruby-throated Hummingbirds can be seen in the morning hours, feeding on the nectar from the Fire Bush. You may want to book a couple nights in one of our air-conditioned cabins. Built by the CCC in the 1930’s, you can get an idea of what it was like living here eighty years ago! Our cabins offer a complete kitchen, hot showers, two double beds and a beautiful back porch. An oasis from the rest of the world, you won’t be disappointed. We also offer over 40 full hook up sites for RV’s and Campers. Please call Reserve America for reservations at 800-326-3521. Please come visit Myakka River State Park this summer and see what The Real Florida is all about. The park is open from 8am to sunset every day of the year. The back gate is open from 8am to 5pm on weekends and holidays. The concession is open every day of the year except for Christmas and Easter. For more information call the ranger station at 941-361-6511.